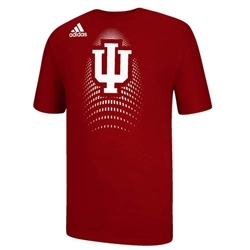 Here is a terrific Adidas t-shirt from the 'Toxic' line. Bold IU graphic with an oversized Adidas logo makes this shirt a 'go to' shirt in your closet. Made of 100% cotton in crimson with white screen printed decoration. Unisex (mens) sizes.